Brisbane seems to have taken us slightly unawares. We thought it was a nice place and were enjoying wandering around taking in the sights and sounds that it had to offer when suddenly …… wham! Like a lightening bolt …….. We Love Brisbane. We weren’t expecting this at all but Queenslands capital city has sneakily wormed its way into our hearts and made us fall for it. It wasn’t love at first sight but we are now hooked. The atmosphere and the character of the place have completely won us over. Every day is still a great big adventure for us that we are trying to grasp and make the most of. We don’t always know where we’re going or what we’re doing but we are doing it together. Important news to catch up on first. I am feeling a lot better now, thanks to everyone for their good wishes. The rooster that wasn’t a rooster is now a rooster for sure and looks like his days in West End may be numbered. The juggling training has started (more on that later). 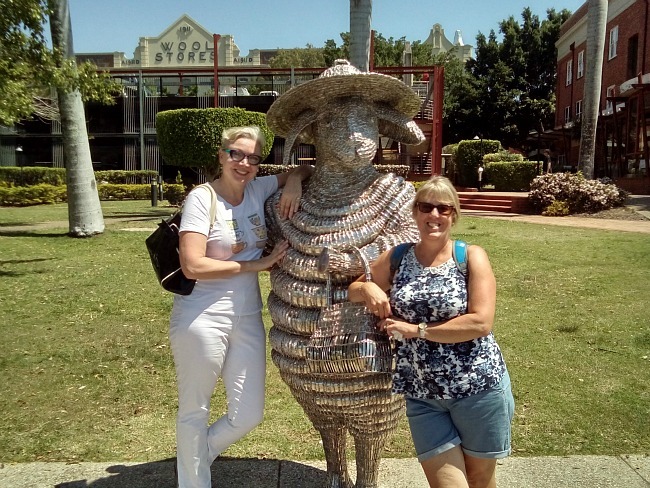 After a great start to our time in sunny Brisbane we continued with some more amazing days out. We’d arranged to meet Helen again, Ella’s Mum just in case you didn’t read the previous blog, and she kindly drove us up to the highest peak in Brisbane called Mount Coot-tha. It was originally an Aboriginal settlement meaning ‘Place of Honey‘ and has a perfect view over the whole city. It was unbelievably hot that day but we soldiered on and visited the Botanical Gardens for a quick drink before heading across town to Tenerife where we had a glorious walk along the river with Helen pointing out the sights. She had mentioned that she would introduce us to a friend of hers called Gloria so we were looking forward to meeting a blonde, athletic, tanned Aussie. Well I was. 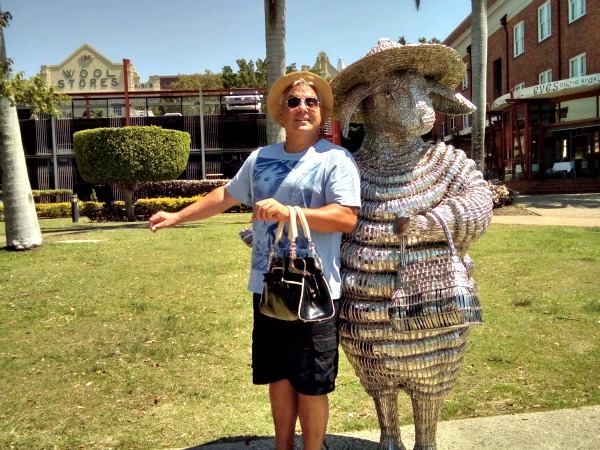 Bizarrely Gloria turned out to be a big silver sheep! Couldn’t resist a few photos as apparently Gloria was very popular with Helens family, especially her late Mother. Unsurprisingly our Ella absolutely loves Gloria too! Maybe. 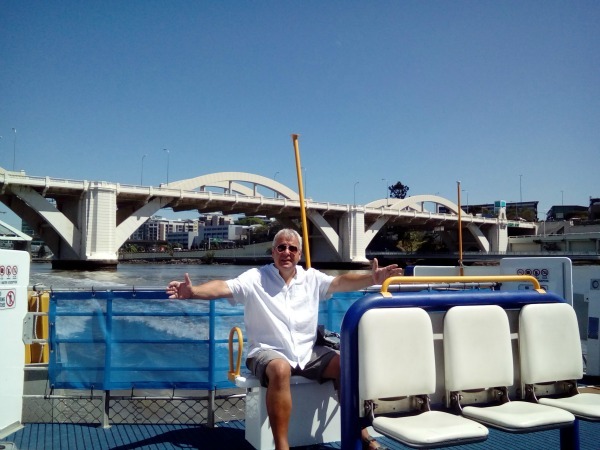 Lovely day out ended by a ride down the Brisbane River on a CityCat catarmaran. We love the ferry. Following day saw us back in the city but heading for the second oldest building in Brisbane, The Commissariat Store. Built in 1829 by convicts for the local penal settlement it is now the Royal Historical Society Museum. 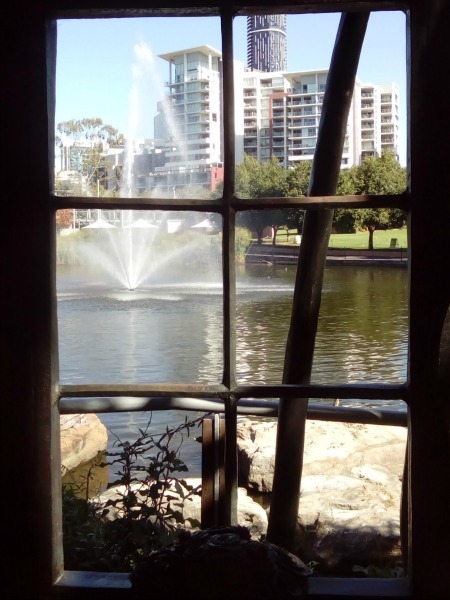 After a leisurely stroll stopping for a quick coffee and lemonade at ‘Jimmys on the Mall‘, we had our squashed sandwiches and warm crisps for lunch in the Roma Street Parklands. What a great place, full of boardwalks and waterfalls and incredible tropical plants, we wandered around for ages. 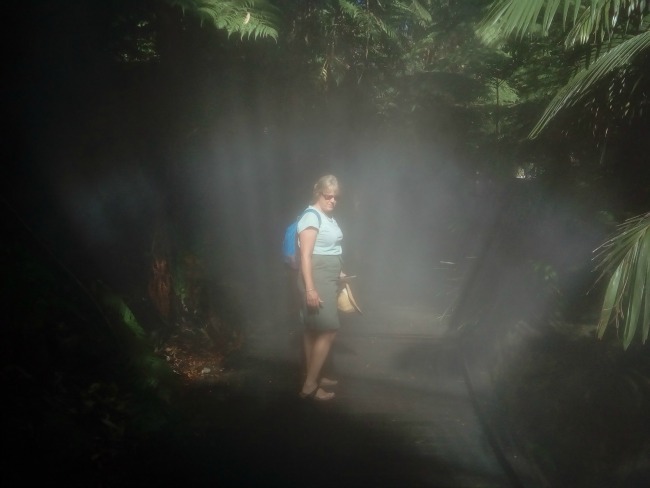 It is the world’s largest sub-tropical city garden and the misty, water-sprayed tropical area was simply amazing. I’ve never seen so many lizards in one place though, in fact they aren’t lizards (according to Orlando my six year old friend) they are actually Eastern Water Dragons. Sound far more sinister don’t they? Anyway, hundreds of them charging about and running in front of us but mostly just sitting staring at the sun. It was like Jurassic Park. 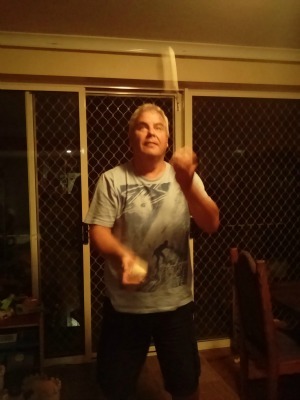 I think it may be time to mention the whole juggling thing now. As Jo said previously, I decided that I’d like to try and become a decent jugging type of guy. 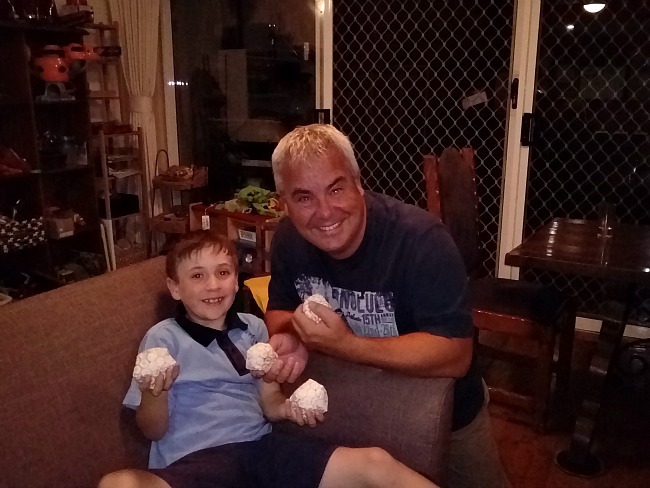 I used to be ok but lack of practice has made me a bit dangerous lately, so my little buddy Orlando kindly lent me his juggling balls to get started. Successful? Well perhaps a little. It’s like riding a bike but without the brakes and having any control. Been practicing each day for a while now and it’s coming back slowly. I’d love to be able to do four balls at once but we’ll see, early days and it’s just a matter of practice, practice, dropping balls, and practice. And Orlando, our hosts six year old son, has been helping me hone my skills. When I say skills you know I mean lack of skills! 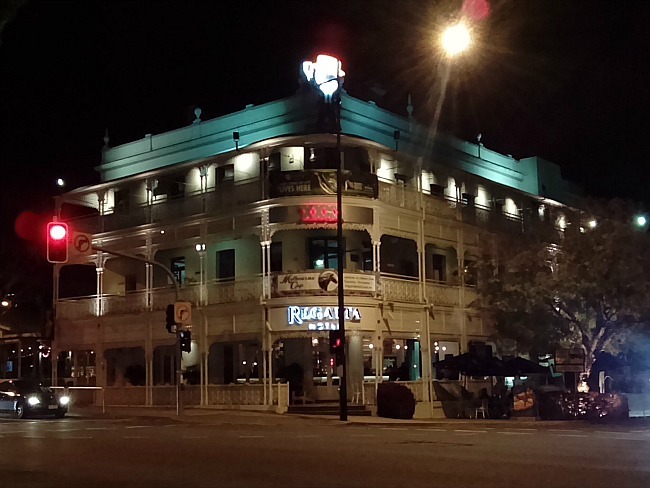 We’d seen it from the river and read about it online and decided that we fancied visiting The Regatta Hotel on the other side of the river in Toowong. It’s an old colonial style of building which is 150 years old, has been flooded out twice, and has a whole host of different bars inside. The fish and chips were fantastic as were the several glasses of wine and beer that seemed to appear with them. How could I resist ‘Minimum Chips‘ and ‘Lazy Yak‘ beers? I’d read that there was a secret underground ‘speakeasy’ bar underneath the Regatta Hotel called ‘The Walrus Club‘ (first rule of the Walrus Club is no-one mentions the Walrus Club …….ok?). It’s address is listed as ‘Somewhere Underground’ so we tiptoed around looking for a hidden door but unfortunately and disappointingly it was closed. Next time. Interesting fact No.1: Lazy Yak beer is made from a hop called ‘Pride of Ringwood‘. Who’d a thought it eh? That brings us to our tour of the Brisbane Cricket Ground, called ‘The Gabba‘ (after the area it’s in which is called Woolloongabba). We just had to visit after enjoying our visit to Perths ground a few weeks back. The Gabba is quite a new stadium though, rebuilt over the past 22 years, and hosts cricket in the summer and Aussie rules football in the winter. The tour was interesting as we wandered through dressing rooms and press boxes then around the stands and the pitch. What made it great though was the guy doing it. He was 79 years old and had a thousand stories to tell. All of the rest of the tour party were getting seriously cheesed off as I asked him question after question about cricket and the stadium, I could have talked to the fella for hours. When he was winding things up and said ‘so I hope you enjoyed it, is there anything else you need to know‘ I looked at the faces of the women and children desperate to leave and launched more questions at him ……. ‘what was the first match you ever saw here‘ and ‘who is the best player you’ve ever seen‘ and ‘how many test matches have you seen here‘! He loved it. Not sure the others did. It was brilliant. Big thanks to him for making our day. If you’re interested, his first match was Australia vs NZ in 1949, he actually saw the legendary Don Bradman play and then went on become friends with him. The best player he said he’d seen was Ian Botham. Reckoned he put 10,000 on any crowd when he played as he was just so exciting to watch. And finally he couldn’t remember how many tests he’d watched, he reckoned 5 or 6 a year since 1950 which is a few. 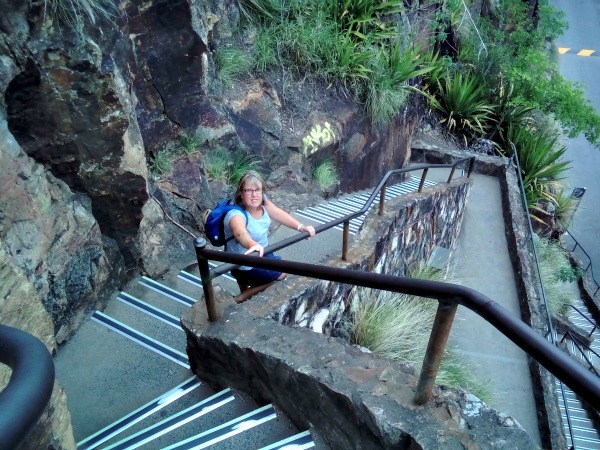 Fabulous walk after leaving The Gabba, we made our way up through Kangaroo Point to Story Bridge. Kangaroo Point no longer has very many kangaroos, roughly none, but is a lovely parkland on the rivers edge. Well maybe not ever but it was strange. We jumped on the local 198 bus going from West End to Woolloongabba (via Ipswich of all places). No problem. Asked the friendly driver which stop was best for The Gabba and he just seemed a little confused and told us what I’m sure was a made up road name. As the journey continued he started to ask some of the passengers what road we were in, and where the next turning was. A little worrying. Then he called an older chap up front and enquired if he’d heard of Boundary Street. We were actually in Boundary Street! More increasingly worrying questions followed about whether we need to turn left or not before he called in on his radio for instructions. Confidence was dropping amongst the passengers as he mentioned the traffic on Vulture Street which we hadn’t been anywhere near. An old lady tried to get off in Ipswich but he convinced her it wasn’t her stop (wonder where she is now?). We eventually saw the floodlights of the stadium and hit the ‘stop’ button immediately. He looked like he was just about to offer more directional advice but Jo was having none of it and we leapt off. Close escape. 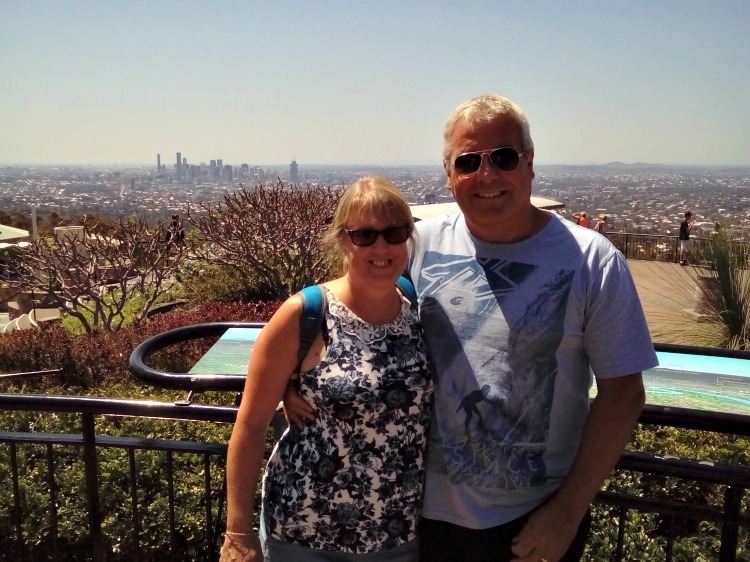 We only have a day or two left in Brisbane before we head south to the bright lights and big city of Sydney (Land Sailing into Sydney Harbour , Sydney Harbour and the Manly Scenic Walkway ). We’re staying in the city for a couple of days before moving out to a place called Manly right on the coast. Leaving Brisbane will be really quite sad as we feel so comfortable and relaxed in this sunny friendly city and we are enjoying living with the lovely Louise and Orlando so very much. We’ll miss them. Better get some serious juggling in before we go! Exciting amazing news! Our son Ryan, and his lovely girlfriend Ella, have just arrived in Brisbane at the beginning of a month away visiting Ella’s family and sightseeing. We couldn’t quite get our dates matched up so Jo and I are in New Zealand whilst they are literally a stone’s throw away in Australia. They’ll have a wonderful time creating their own ‘Adventure Stories from Brisbane‘, and will be seriously spoilt by Ella’s Mum Helen, who I’m sure is super-excited to have them visiting. Just hope Ryan behaves and gives a good impression suitable of being our son and heir. Ella, Gloria and Ryan in sunny Brisbane. Gloria and Ryan. Or is it Ryan and Gloria? Who can tell? Previous Is Brisbane the best city in Australia? Loving Brisbane. 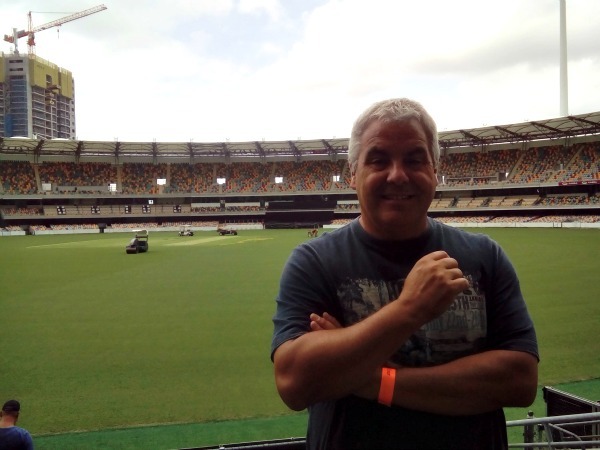 The picture from the Gabba is my favourite because it has clouds in the background! All the others look too sunny and warm. Pathetic hat! Must try harder Jon; you flamin’ gallah! You’ve never met Gloria? You haven’t lived Desley. We’ve had an amazing time in Brisbane thanks, we love the place. LOL I will try to meet her before I move to Melbourne. Safe travels! It may well have just become our most favourite city too Gaynor. We have to come back some day. I’m really sorry i haven’t commented for a while (or kept up with your travels) – it’s been a very busy time here! I was absolutely shocked to read that you had landed in Oz already, and from the looks of it have been there for a little while! Your time is flying by, it must be going even quicker for you? I was so happy to see that you’re still having a fantastic time, and it sounds as though you really have fallen for Brisbane? 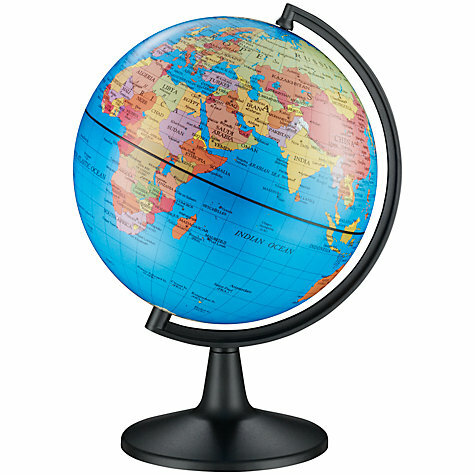 Would you consider moving there permanently once your travels come to an end? It’s been all go for me here – i’m now a married woman, and will be reaching the 7th month of my pregnancy this Sunday. I can’t believe how quickly it’s going! We’ve got a 3/4D scan next week so get to see our little man which i cannot wait for. He’s a very active little baby and i keep being reminded of his presence with a little kick here and there. It’s an amazing feeling though and we can’t wait to meet him. Have a safe journey to Sydney, and i hope you love it just as much as Brisbane. The photos show you’re having a wonderful time and i’m just so pleased for you both. How did your son’s wedding go by the way? Glad things are going well and you are having such a wonderful time! Unbelievable scenes, again! Some great pictures on this page aswell. Nice tan Jon! So glad you loved my hometown! Brisbane is truly under-rated, although the secret is starting to get out now. Enjoy your time in Australia! Hey Genevieve. Absolutely loved your hometown, and you’re so right that it is under-rated. Still my favourite city in Australia. It has a sort of smalltown feel about it, very friendly. 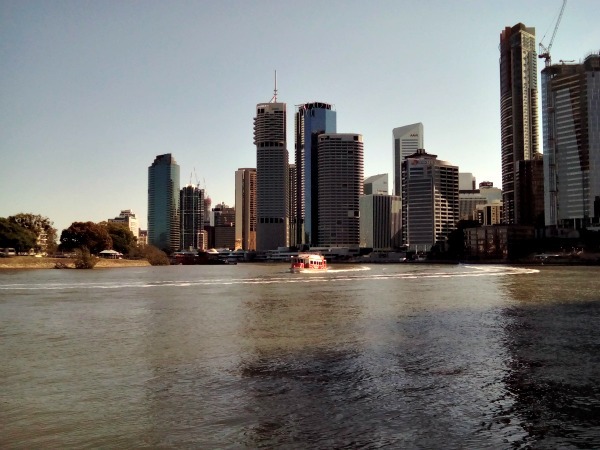 We love Brisbane too – its definitely our favourite above Sydney, Melbourne and Hobart. We’ve not properly explored Perth, Darwin, Adelaide and Canberra yet but plan to put that right later this year. I have to agree that Brisbane is the best Aussie city. Perth and Hobart were great too but wouldn’t go back to Sydney or Melbourne.